Glendambo is a town and locality in the Australian state of South Australia located on the Stuart Highway about 592 kilometres (368 mi) from the state capital of Adelaide and about 254 kilometres (158 mi) from Coober Pedy. The town was constituted on 13 May 1982 and was derived from the Glendambo Homestead. Boundaries for the locality were established on 23 October 2003 and include both the homestead and the Government Town of Glendambo. Located 592 km from Adelaide and 186 km north of Port Augusta on the Stuart Highway, Glendambo is an important stopping point on the Stuart Highway as, if you are travelling north, there are no more facilities for 254 km until you reach Coober Pedy. With a population of around 30 people and an annual rainfall of only 185 mm it will never grow into a major centre. It is a comprehensive roadside stopping point with a caravan park, a hotel-motel, a licensed restaurant, roadhouse and general store. At the 2016 census, Glendambo had no people living within its boundaries. 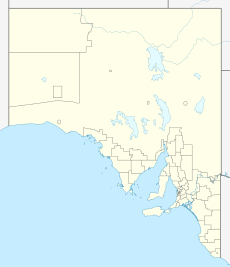 Glendambo is located within the federal Division of Grey, the state electoral district of Giles, the Pastoral Unincorporated Area of South Australia and the state’s Far North region. In the absence of a local government authority, the community in Glendambo receives municipal services from a state government agency, the Outback Communities Authority. ^ a b c d e f "Search results for 'Glendambo, GTWN' with the following datasets selected - 'Suburbs and Localities', 'Government Towns', 'SA Government Regions', 'Local Government Areas' and 'Gazetteer'". Location SA Map Viewer. South Australian government. Retrieved 14 April 2019. ^ a b Australian Bureau of Statistics (27 June 2017). "Glendambo (State Suburb)". 2016 Census QuickStats. Retrieved 14 April 2019. ^ a b Arnold, Peter (13 May 1982). "CROWN LANDS ACT, 1929-1980: TOWN OF GLENDAMBO, OUT OF HUNDREDS (KINGOONYA) CONSTITUTED" (PDF). The South Australian Government Gazette. Government of South Australia. p. 1571. Retrieved 14 April 2019. ^ "Glendambo Postcode". Australia Post. Retrieved 23 September 2016. ^ a b c "Monthly climate statistics: Summary statistics Woomera Aerodrome (nearest weather station)". Commonwealth of Australia , Bureau of Meteorology. Retrieved 20 September 2016. ^ "Glendambo". Sydney Morning Herald. 8 February 2004. Retrieved 23 September 2016. ^ "Communities (serviced by the Outback Communities Authority)". Outback Communities Authority. Archived from the original on 2 March 2016. Retrieved 23 September 2016.